For my first gaming related post, I wanted to share the “console wall” I created in our basement a couple years ago. 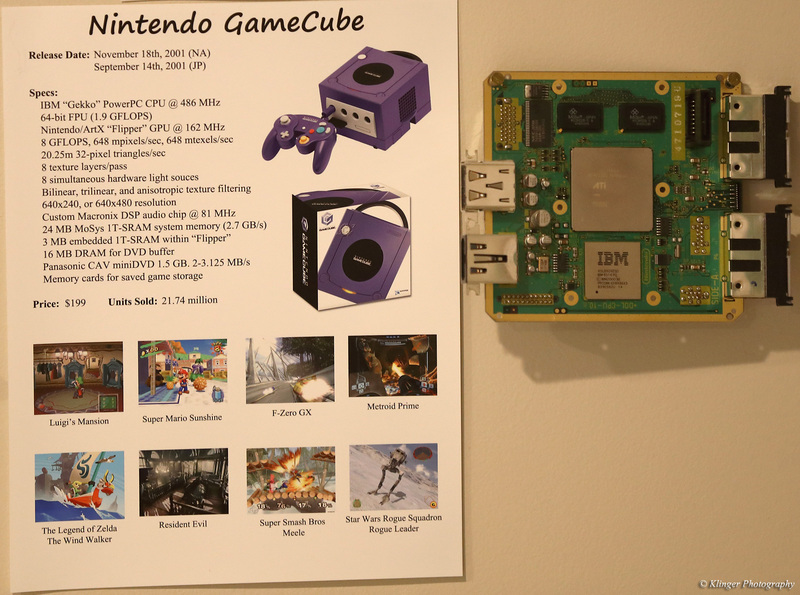 It covers all the major home gaming consoles from 1976 to 2006. From the enhanced-Pong-only Odyssey 300 to the Nintendo Wii. 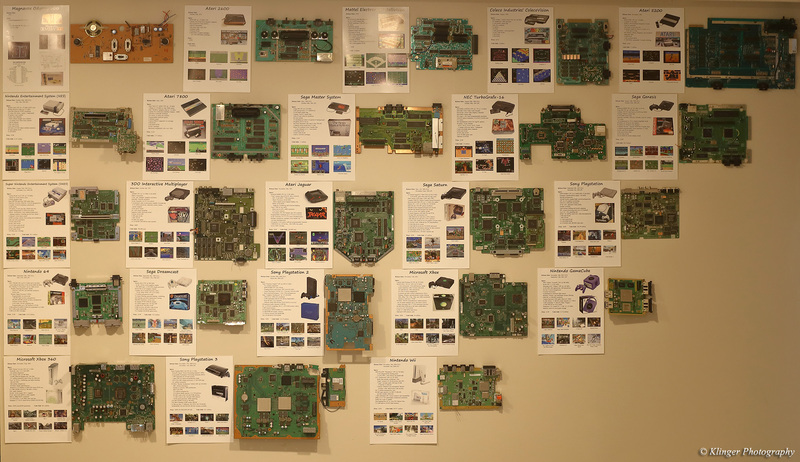 I first had the idea to create a display like this when I was organizing some of my old gaming equipment. I decided it was time to unload a bunch of my old stuff, so I sold some of the more valuable games I had on eBay. The hardware itself though, really wasn’t worth enough to make selling them worthwhile, and I couldn’t bring myself to throw them away. My five originals on the wall were the SNES, Playstation, N64, Dreamcast, and Gamecube. I have always thought of the engineering work and design that goes into making these machines, as a work of art, so what better way to honor them than to make a museum type wall. I was able to pick up most of these games fairly inexpensively on eBay because you can get them as “broken” or “as-is”. Some of the older ones and low-volume sellers (like the Jaguar, 3DO, and Colecovision) are a bit harder to find, but they are still out there. I created a one-page display for each one that describes a bunch of the technical details of each machine, when it was released, and some of the most popular games. 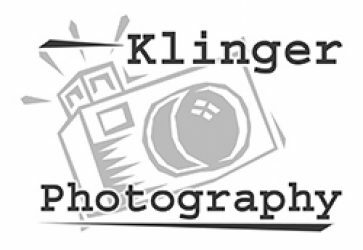 I’ve taken pictures of each one individually which I will share below so you can see them in detail. Another thing I think is really neat, is that this is a great example of Moore’s Law. If you aren’t familiar with that, Gordon Moore (co-founder of Intel) basically said the number of transistors that can fit on a computer chip will double about every 2 years. The number of transistors on a chip is directly proportional to how much it can do. The more transistors, generally the faster it can go, the better the graphics look, etc. Amazingly, this law, which isn’t a law at all, but more of a prediction, has essentially held true for the past 40 years! The actual transistor counts of all these console chips aren’t easily available, but some definitely are, and the trend is unmistakable. When available, I usually put that information on the data sheet I created for each machine. To get a general feel for it, the very early machines like the Odyssey and Atari 2600 had about 1000 to 2000 transistors. 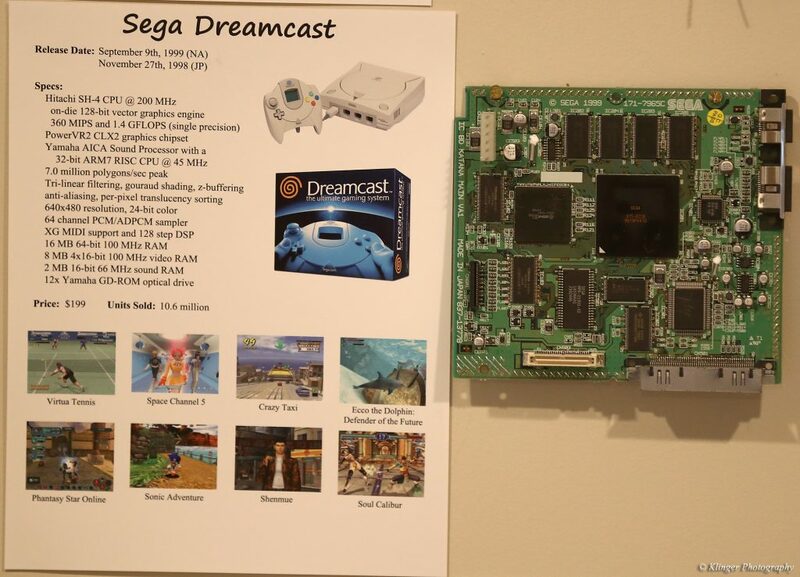 By the late 1980s, with machines like the Sega Genesis had maybe 100,000 total transistors. 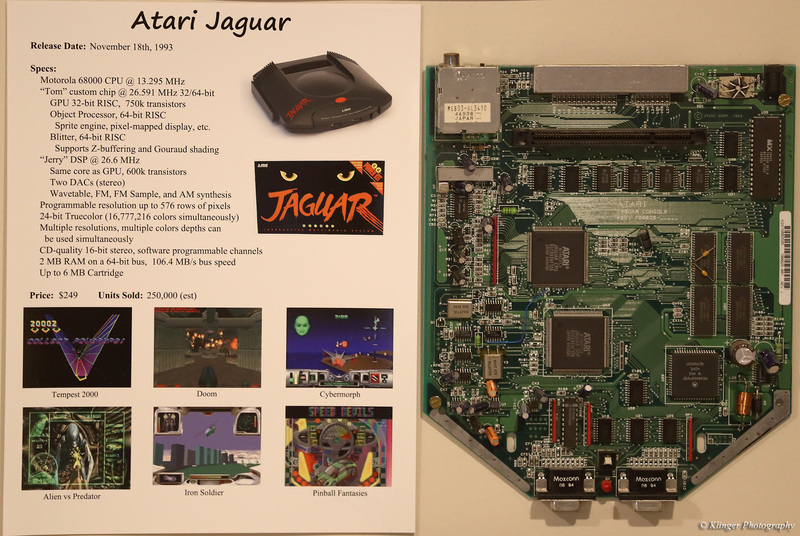 By 1993. the Atari Jaguar’s GPU (graphics processing unit) had 750,000. 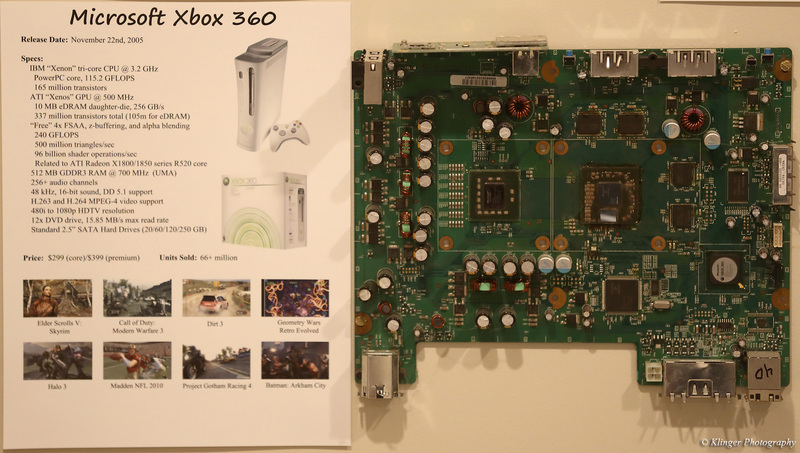 The Microsoft Xbox 360, released in 2005, had a GPU with 337 million transistors. Not on the wall, but if we jump all the way to 2017, the NVIDIA GeForce GTX 1080 Ti GPU in my current computer has 12 billion transistors!! Without further ado, here are the first batch of machines. These are the 1970’s machines. There were many analog Pong games before 1976. My Dad built one from a Heathkit kit which I remember playing. 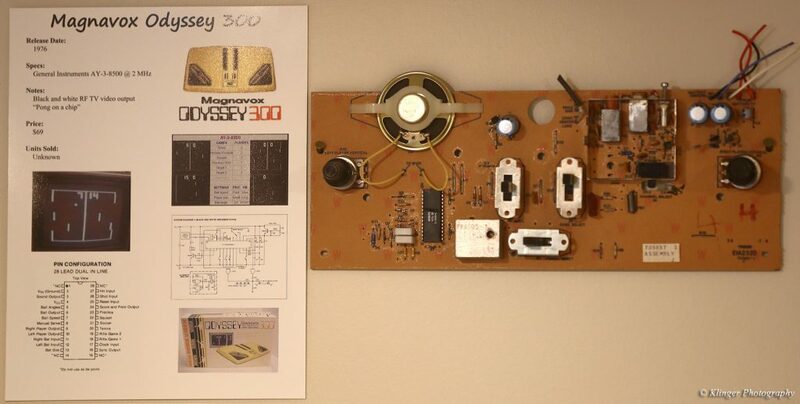 I chose to put the Magnavox Odyssey on the wall as it was one of the very first that used an IC (integrated circuit), or digital chip for all the hard work. If you look carefully, there are actually two individual transistors on that motherboard! Imagine 12 billion of those (or 12 billion vacuum tubes, which do the same thing), on a modern chip. I never owned an Atari 2600, but it was extremely popular and I played quite a lot at friend’s houses. It sold around 30 million units with a 2017 inflation adjusted price of around $800. That is pretty impressive. 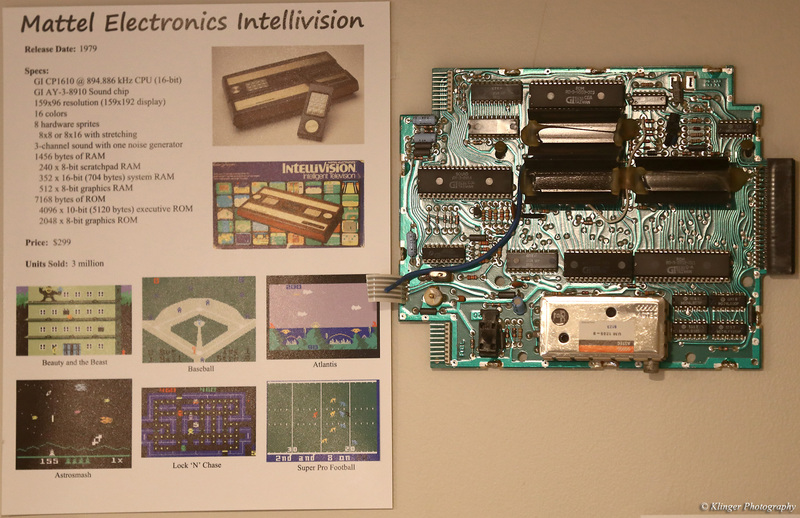 We had an Intellivision in our house when I was growing up. I used to play Astrosmash a lot! It was definitely my favorite game on that platform. I remember take a Polaroid picture of the TV of a score of 1+ million and submitting it for some contest, which I can’t remember exactly. The early 1980’s saw three big machines come out. 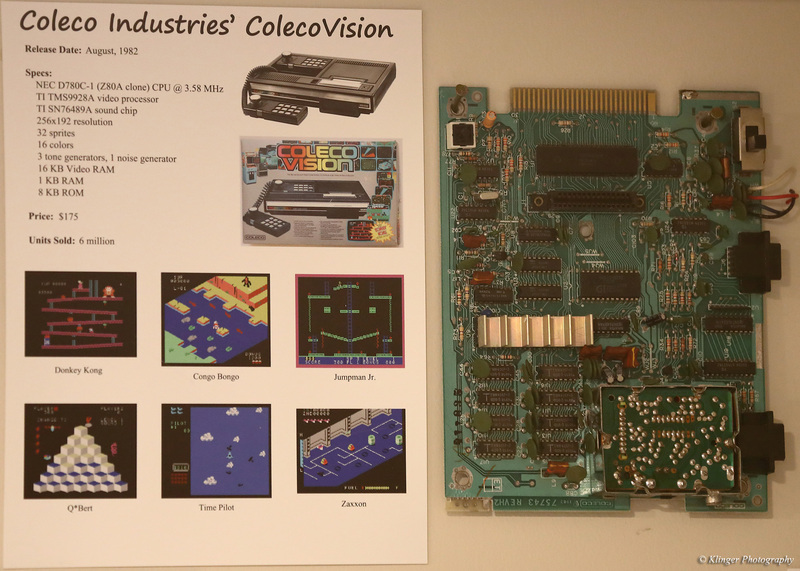 I remember I was always impressed with the Colecovision’s graphics, especially compared to the earlier machines like the Intellivison and Atari 2600. Donkey Kong was probably the most famous game on that platform. 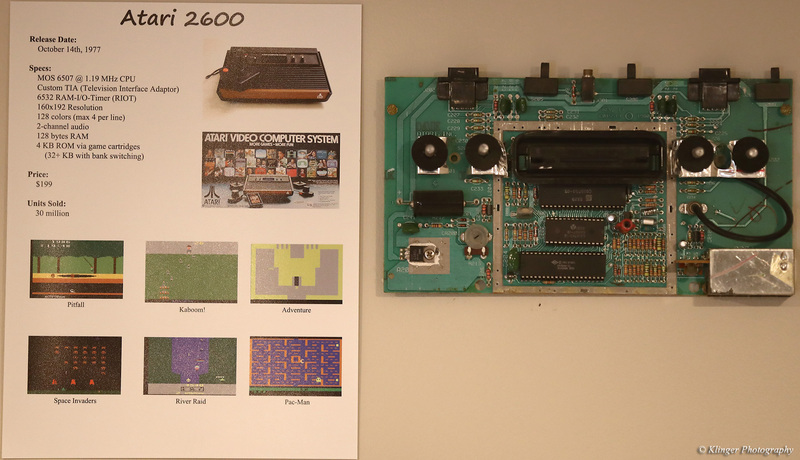 The Atari 5200, as you can tell from the picture, was a large machine. It was really just a stripped down Atari 400/800 computer. I never owned one and never even played one from what I recall. For the time, some of the arcade ports were very good. Apparently the controllers were terrible, like unplayably bad. It’s amazing that Atari would screw that up so bad. I put the Nintendo Entertainment System (NES) after the Atari 5200 based on the North American release date of Oct 1985. It actually came out in Japan quite a bit earlier in July, 1983. This machine was responsible for rebooting the entire gaming industry after the early 1980’s video game crash which killed most of the arcades and earlier consoles. I never owned one of these machines, but played many hours at friend’s houses. The Legend of Zelda was an industry changing game. 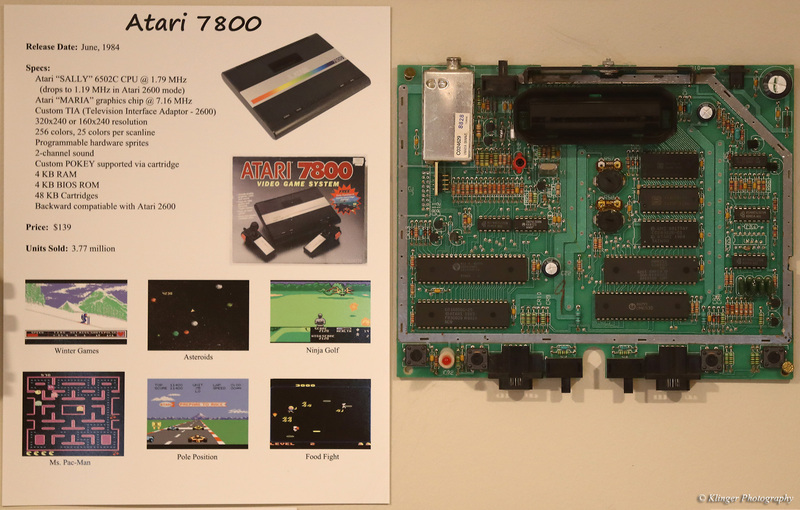 The Atari 7800 was Atari’s reaction to the NES. It had decent hardware, but it was too little, too late. 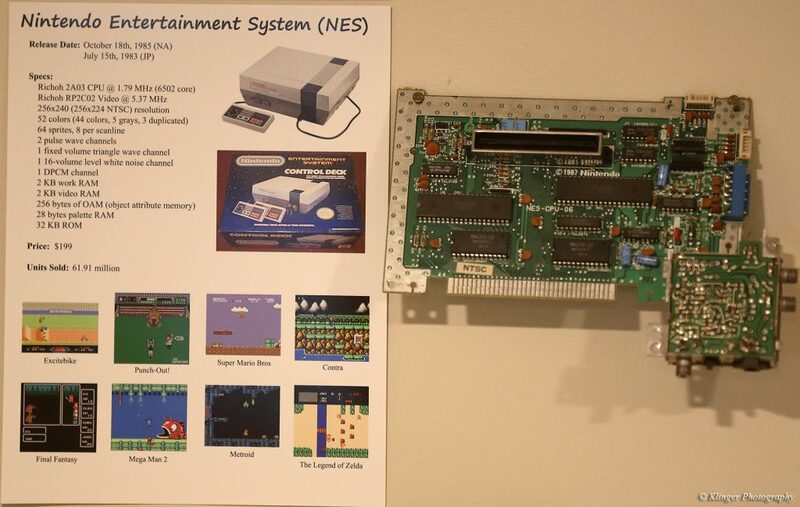 It sold about 4 million units compared to around 62 million for the NES. Atari would never really recover after this machine. 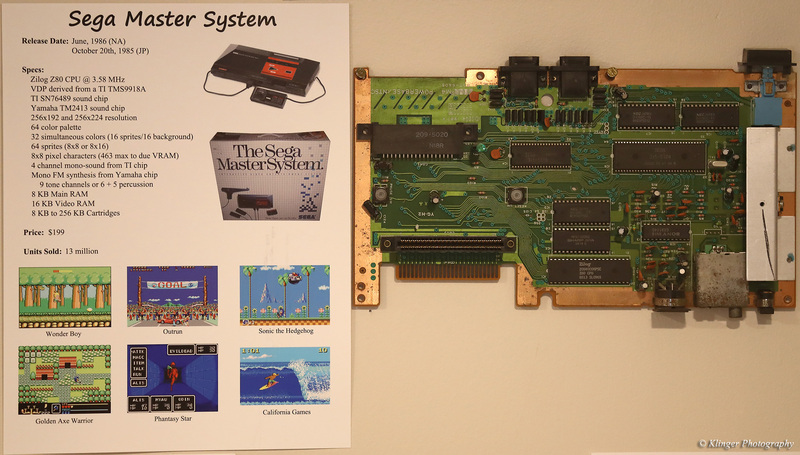 The Sega Master system fared much better than the Atari 7800, and sold about 13 million units. 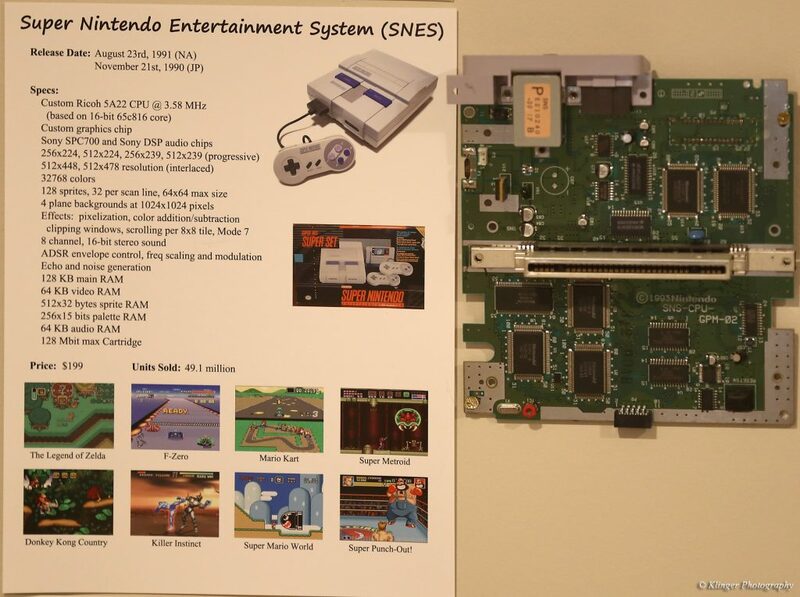 This was the beginning of the massive console “wars” between Nintendo and Sega. 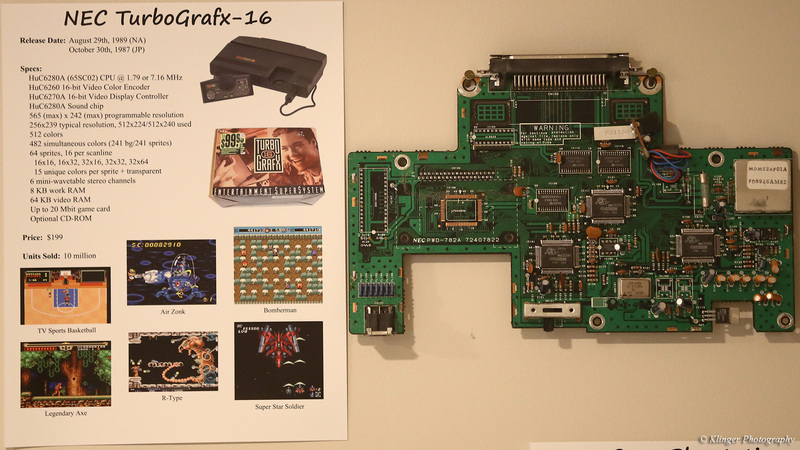 The TurboGrapfx-16 was not hugely popular in the United States, but sold pretty well in Japan. Games like R-Type were this machine’s strength. 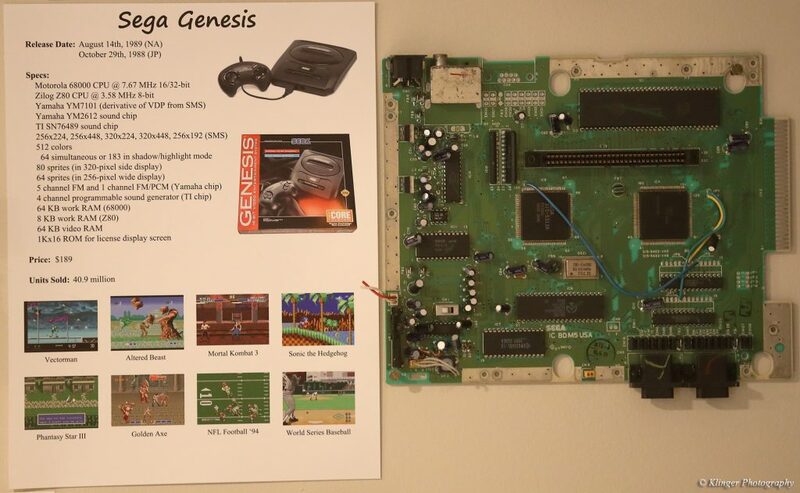 The Sega Genesis, released in August, 1989 in North America, was a pretty big deal. It had a very powerful CPU for the time, the same Motorola 68000 used in popular home computers at the time like the Amiga, Macintosh, and Atari ST. Fun fact, the Motorola 68000 got its name for the number of transistors inside, 68000! Modern CPUs today have over 7 billion transistors. I really enjoyed the Super Nintendo. This was the first console I actually purchased as an adult. This machine and the Genesis were often compared directly. Both were very popular and each had their own strengths and weaknesses. Generally, the SNES had better sound and some graphics effects, but the Genesis had a stronger CPU. There were many great games for both machines. The 3DO was an interesting machine. Up until this point, companies typically subsidized the price of their hardware and made their money back on software. The 3DO model was very different. 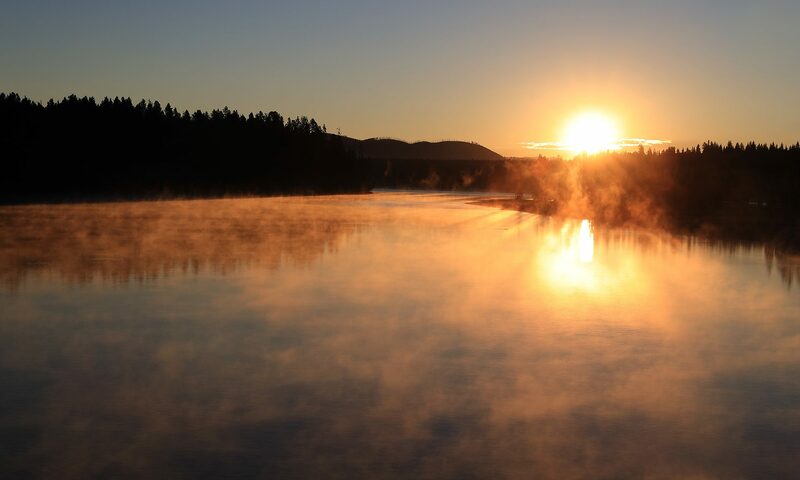 It was designed as a technology platform that could be licensed by anyone who wanted to manufacture the hardware. 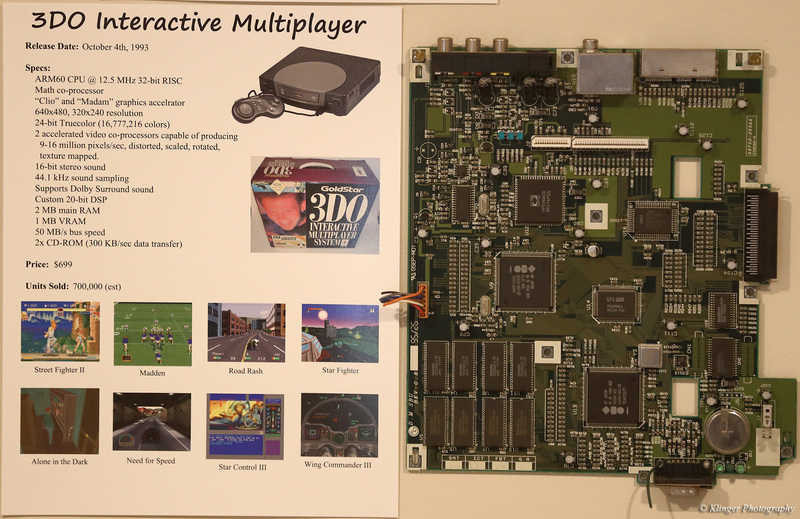 The actual hardware design was very advanced for the time, with basically the first real 3D hardware and CD-ROM. The downside was it cost a fortune for the consumer. The hardware manufacturers had to at least break even on selling the hardware. The retail price was an unheard of $699, or nearly $1200 in 2017 dollars. Not surprisingly, it didn’t sell well, only selling about 700,000 units. The Atari Jaguar sold even worse. Only about 250,000 units sold over its lifetime. 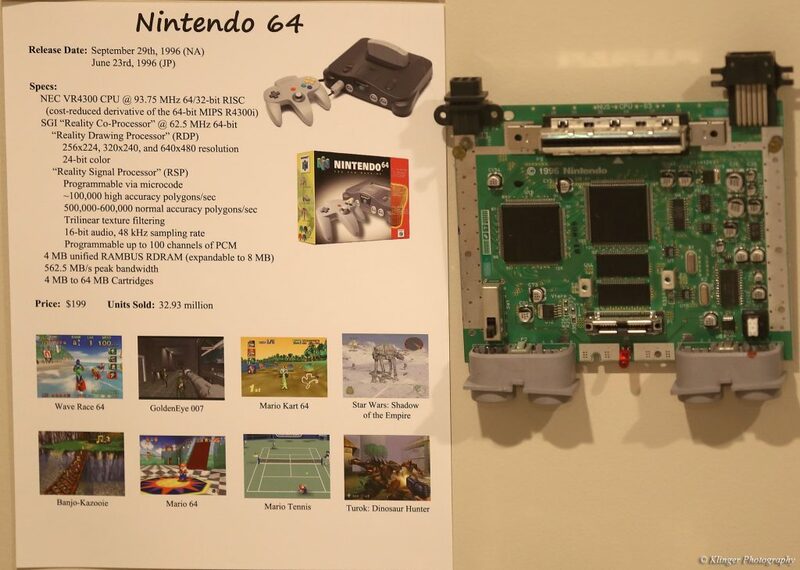 It was touted as the first 64-bit console, but that was only partially true due to the complex nature of the architecture. It was very difficult to program to its full potential, and developers tended to use the Motorola 68000 CPU as the primary CPU instead of the much more advanced co-processors. Not many good games were made on this platform, although Tempest 2000 is a major exception. 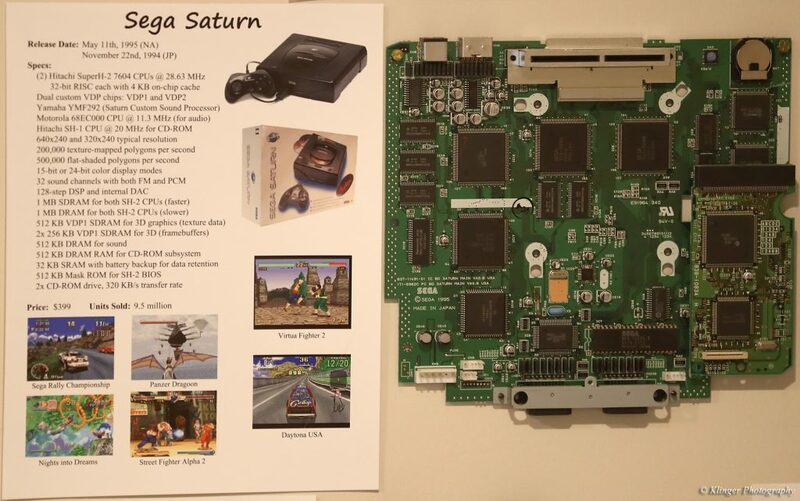 The Sega Saturn was the final transition console from 2D to 3D. It had incredible 2D hardware, mostly coming from the Sega arcade division’s influence, but it didn’t do 3D nearly as well as what would come from Sony just a few months later. 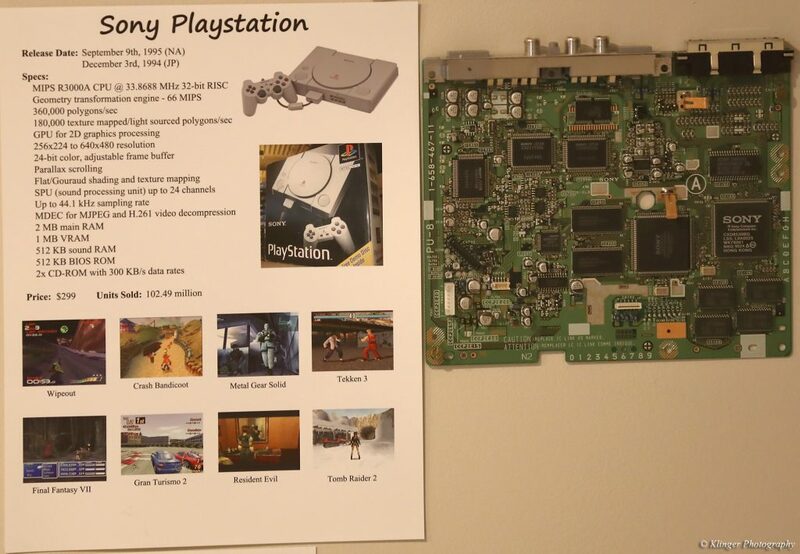 The original Sony Playstation was a ground-breaking console. Released in the Fall of 1995, it had state of the art 3D hardware. Home computers at the time couldn’t out-perform it, and it rivaled the best you could find in the arcades. I bought this machine on launch day, and enjoyed it quite a bit. It sold over 100 million units! I also bought the Nintendo 64 on launch day. It was another ground-breaking console providing visuals not seen on anything but high end computer workstations. The graphics chips in this console were developed by Silicon Graphics and used many of the techniques as their Reality Engine supercomputer graphics boards. Mario 64 is still considered one of the best games of all time on any platform. I bought this console soon after its release. It was Sega’s first real 3D console and it was well ahead of its time. In many ways, it was more advanced than the Playstation 2, but was never as popular. The monster Sony Playstation 2. It sold over 150 million units, but I never bought one. My console gaming had declined at this point. There were tons of great games for this platform though. 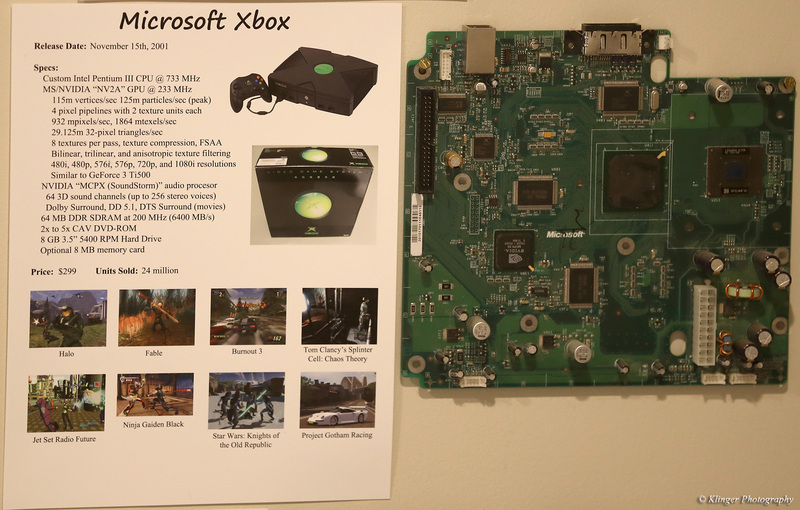 Microsoft’s answer to the PS2 was the original Xbox. It was really just a standard PC stuck in a console box. It had good hardware for the time, so it did fairly well. I jumped back into console gaming a bit with the GameCube. I liked some of the Nintendo specific games, which aren’t available anywhere else, which makes buying these machines attractive. Hardware wise, it was not as powerful as the Xbox or PS2, but it was cheaper. This trend would continue for Nintendo. I bought an Xbox 360 on launch day. The early versions were notorious for having hardware overheating problems, and I had to exchange mine, but when it worked, it was a great platform. It sold over 66 million units and was a huge success for Microsoft. 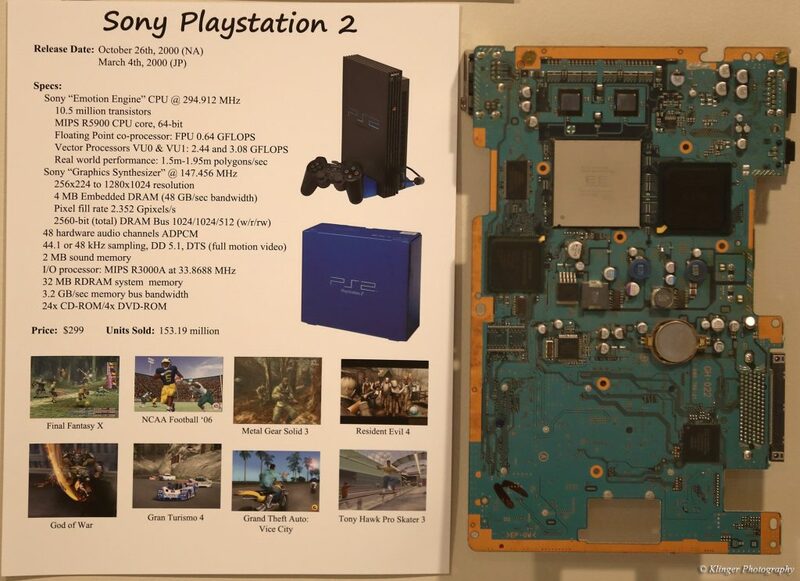 Sony’s Playstation 3 was a big deal. It contained a massive new Cell CPU which was highly parallel and really started getting game developers to think about multi-core CPUs. The Xbox 360 had a 3-core CPU, and the PS3’s CPU had 8. It was very difficult to program though, so it wasn’t until later in its lifespan did you see some really amazing games. 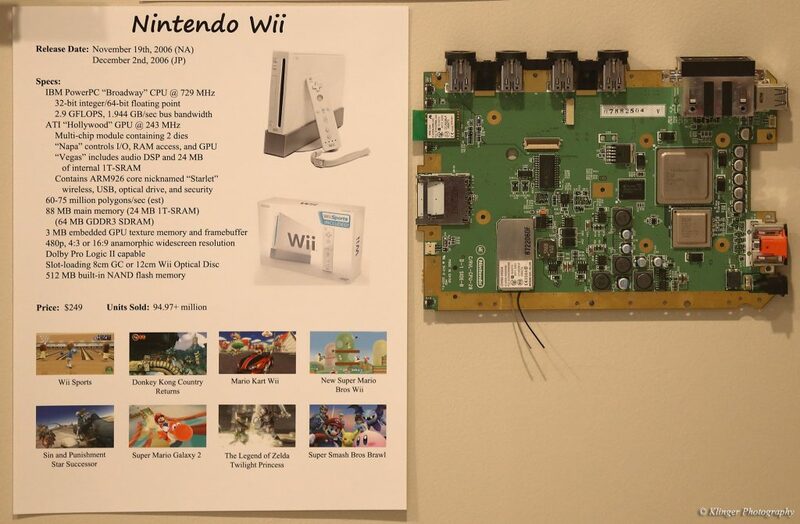 In a duplication of strategy of the GameCube, Nintendo launched the Wii as a less-powerful, but less expensive console. This time, they had the motion sensitive Wii Remote which allowed for gameplay never seen before in a console. It was a huge success, selling nearly 95 million units. I have not acquired the latest round of consoles to put on the wall. The PS4 and Xbox One are really almost identical to each other. Both use mostly off-the-shelf PC hardware. The very recent PS4 Pro and Xbox One X really are just PC-like upgrades to the console. Unique hardware gaming consoles may be dead. They are also no longer really more powerful than the current PCs at the time of their release. It’s a bit sad to see the state of console gaming, but it’s not surprising either. Nintendo’s WiiU was a significant upgrade to the Wii, but still fairly underwhelming. We do have one, and Anna has enjoyed games like Splatoon, which is pretty unique, but there is nothing special about the hardware. Nintendo’s latest Switch console is more of a tablet that can be plugged into a TV. I hope you have enjoyed this LONG gaming post about my console wall. I really had a lot of fun putting these machines on display and I love talking to people about them when they come over. If you have any great memories of any of these machines, feel free to leave some comments!